It's taken some time, but finally Monster Hunter Generations Double Cross is coming to the West as Monster Hunter Generations Ultimate. No longer will Western Nintendo Switch owners have to wait to have a Monster Hunter game to call their own. For some, it may be difficult going back to a pre-Monster Hunter World game in the franchise. Do you think it will be for you? From one downloadable game on the Nintendo Switch yesterday to another downloadable Switch game (also released last year on Steam), I have a late night review to share. 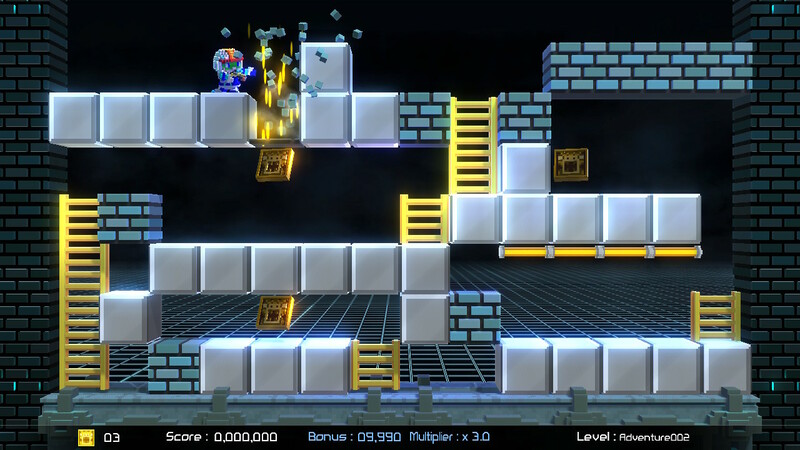 It's Lode Runner Legacy from Tozai Games, and here's the full scoop on it. 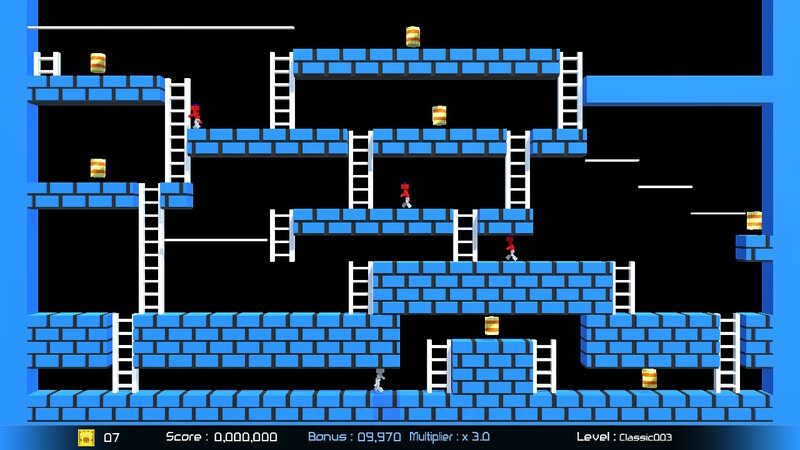 Back in the fourth grade, when I wasn't pretending to pay attention to the latest math lesson (probably a good reason why I'm so bad at math nowadays...), I was eagerly anticipating a break so I could use the old Apple Macintosh computer to play Lode Runner on. Some fellow classmates were more interested in Where in the World is Carmen Sandiego, The Oregon Trail, or Frog Fractions, but your buddy Phil was always wanting to get further in Lode Runner. Now, like the return of a long, lost, old friend, Lode Runner has all of a sudden returned into my life, this time on the Nintendo Switch eShop and Steam with Lode Runner Legacy. 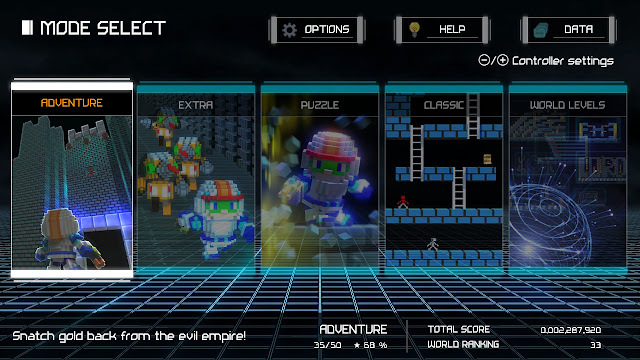 Packed with levels, a new look, and clever creation tools, Lode Runner Legacy serves the legacy of the Lode Runner series well. 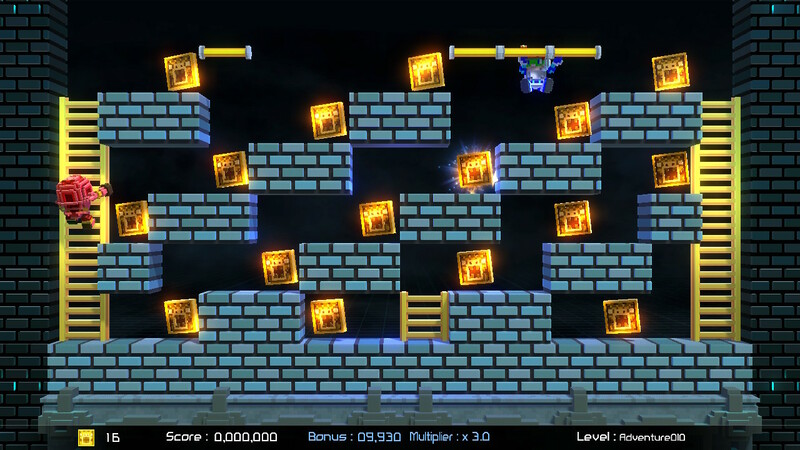 Lode Runner Legacy doesn't mess with the formula that the series is known for. You are placed in levels with the goal of obtaining all of the gold inside while evading enemies. You're not completely defenseless, however, as you have the ability to destroy blocks below him to the left and right. This can temporarily trap enemies that wander over the holes created, but the holes also have another use. Many times you'll need to destroy sections of blocks in order to reach deeply buried pieces of gold. Lode Runner can destroy blocks that allow him to fall through gaps and ensnare enemies. This is where the strategy and critical thinking of Lode Runner as a series comes in. If you destroy blocks with a devil-may-care attitude, you'll usually find yourself trapped, killing you or worse, trapping you inside an impossible situation to overcome, requiring you to restart the level completely. Deaths in Lode Runner Legacy don't mean you have to retry a level; they merely decrease your point multiplier and cost you bonus points after a level is complete. Hang tough, Lode Runner. You can get all this gold if you put your mind to it. For those who want to go the extra distance, there's the option to aim for three stars completion in each level by moving through levels as fast as possible with zero deaths. However, this usually requires that you collect a special sparkling piece of gold first for a big point bonus, which most of the time is placed in a precarious position in the level to nab first. Some deep thinking is needed to figure out to reach this special piece of gold without collecting any other normal gold, 'else you miss you chance for the point bonus. 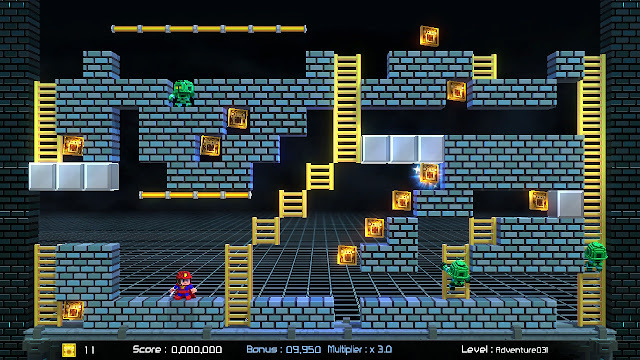 Lode Runner fans will have plenty to keep coming back to in Legacy's many modes. 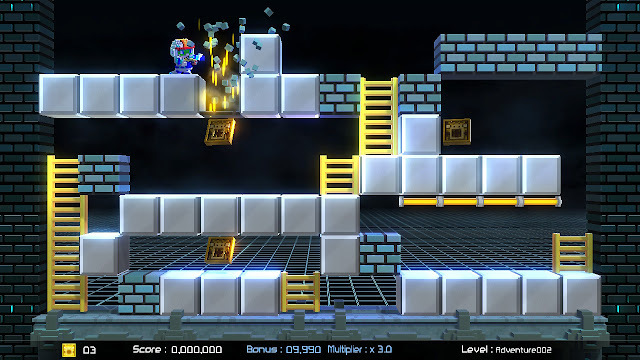 There are five main modes in Lode Runner Legacy: Adventure, which is a collection of 50 levels where each batch of five levels introduces a new enemy type; Extra, which are 20 more levels that feature enemy types exclusive to this mode; Puzzle, which are levels where enemies are completely absent and it's up to you to figure out when and where to destroy blocks in order to complete them; Classic, which is over 100 levels taken directly from the original Lode Runner and given the old school of the game; and World, where you can create your own levels, characters, and collectibles, as well as download and play others' creations. So, to say that Lode Runner Legacy is lacking in content would be an objectionable statement to make. That said, you're pretty much performing the same tasks of collecting gold, destroying blocks, and avoiding enemies in every level, so there is a great sense of repetition involved in the game. There's nothing like the classics, and that is part of what you receive in the Lode Runner Legacy package. The World section of Lode Runner Legacy is the most promising, and it already delivers in some aspects. Being based on user-generated content, there are levels that shine more brightly than others, but thanks to a helpful search system, you can usually weed these out. Even still, you can opt to just play through a random selection of levels one after another, if you haven't gotten a care in the world as to what type of level you play as long as you're simply playing the game in general. The creation tools on offer in Lode Runner Legacy are thankfully simple enough to use. You build characters, enemies, and collectibles one part at a time, and you can use a base model if you so desire to start you off and assist your work. Being able to play as Leonardo from the Teenage Mutant Ninja Turtles, collecting slices of pizza, while avoiding soldiers from the Foot Clan is a possibility, and I did just that. Of course, I couldn't say no to creating a certain character I'm sort of partial to, as seen in the screenshot below. Well, don't YOU look familiar! 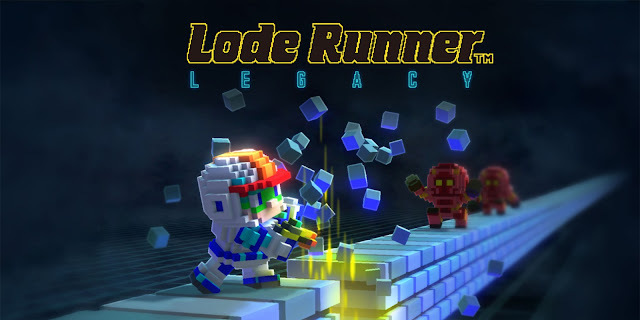 If you love the gameplay of the Lode Runner series, then you'll definitely find lots of enjoyment and hours of fun with Lode Runner Legacy. Everyone else might find the game a bit repetitive and good for small doses only. Whichever the case, Lode Runner Legacy is a stellar action-puzzle game with a bevy of modes, content, and satisfying creation tools to make it a recommended title to represent the Lode Runner series's legacy. Review code provided by Tozai Games. tinyBuild's Garage launches tomorrow on the Nintendo Switch eShop. SuperPhillip Central provides you with a review ahead of its release date. Let's venture into the world of Garage together, brave souls! Not quite the place you'd want to park your car inside of. Indie game publisher and developer tinyBuild has been a huge supporter of the Nintendo Switch, and it has certainly been nice to see, as many smaller publisher and developers have found adequate (if not better) success on the Nintendo Switch eShop with their games. tinyBuild's latest comes in the form of a top-down, twin-stick shooter called Garage. 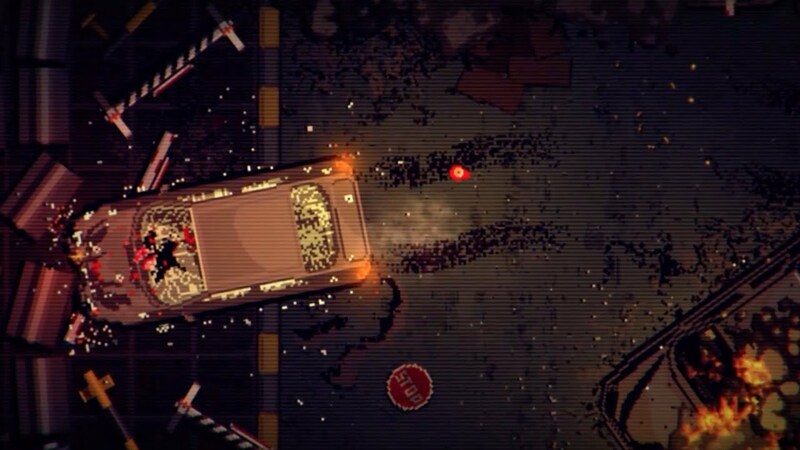 While it has similarities to much more well-known games like Hotline Miami, when it concerns the quality of Garage, the two are in different levels. That isn't a compliment to Garage. 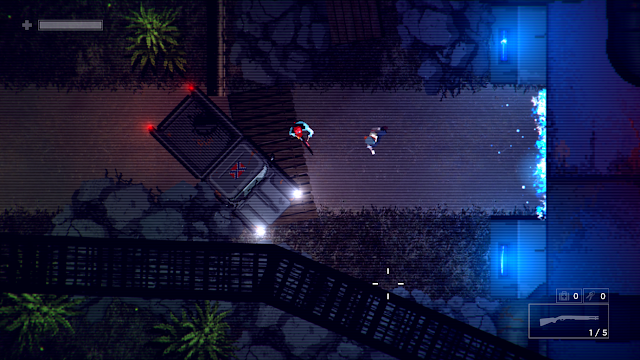 Garage has you play the role of a janitor who dabbles in drug dealing as a side hustle. Left to die inside a locked car trunk, the janitor, named Butch, smashes open the trunk and finds himself in a dreary, desolate, and quite dilapidated parking garage filled with burning cars, fire, and the smell of death in the air. 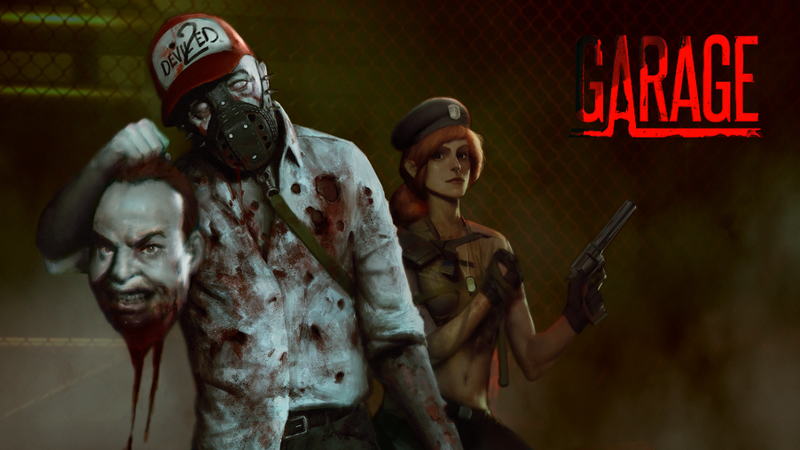 Through exploring through the game's linear levels--acquiring keys to unlock doors, defeating all shapes and sizes of ferocious enemies, and keeping an eye on his health and ammo--Butch discovers that the dead have come back to life. "Thanks for leaving me in this trunk, guys. Could use a nightlight in here, though." Speaking of lives, Butch will definitely have to fight for his own. Garage is a hard game. Even on the easiest difficulty I found myself dying a multitude of times. Some of it was brought on by my own carelessness, while others I fault the game for. Unfortunately, the latter happens in Garage a lot more than the former. For one, aiming with the right analog stick in Garage is a bit imprecise. Many bullets that I'd fire from one of the handful of guns I had available to me in the game (you slowly build up an arsenal as you progress forward through Garage) wouldn't hit their intended target. Not only did this waste precious ammo, but it, of course, left me open for enemies to violate Butch's personal space in a severe, and quite deadly, way. Thus, the weapons, especially the guns, just don't feel great to use, aside from a select few. Let's just say aiming in Garage isn't exactly optimal. Furthermore, when surrounded by a group of enemies, you're pretty much a goner, as there are no invincibility frames for Butch to really speak of. This results on multiple occasions in getting caught between foes, helplessly trying to fight back and clear a path. This is for naught as you end up dying rather quickly. An interesting gameplay concept introduced in Garage that I don't recall being in many other top-down shooters is that enemies will only be visible to the player if they're directly within Butch's line of sight. Therefore, if there are enemies in the room adjacent to Butch and the door's shut, the player won't be able to see them. This results in some good scare moments where enemies can ambush you, but it also limits the player's ability to plot out adequate strategies. Instead, one is just left to do a lot of trial and error--memorizing enemy locations one by one and reacting accordingly. 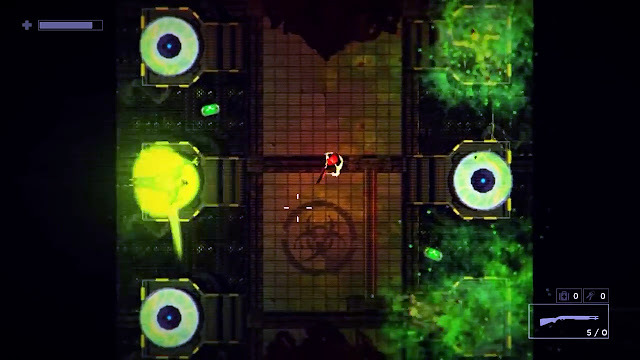 This boss spews out rabid rats and hazardous vomit to attack Butch. Not exactly parking attendant of the year material here, folks. Garage contains 13 chapters, some with multiple parts, that essentially are one area of the game per chapter or part. Basically, every time you see a loading screen after entering an exit, a new chapter or part of a chapter is being loaded. While on the subject of loading screens, Garage doesn't really impress when it comes to these, either. Many of the loading screens can last upwards of a half-minute, which doesn't really place the best impression on a given player. Thankfully, such loading times don't occur between deaths, which again, players will see plenty of within the game. Chapter 10 is supposedly a chase sequence, but as the devs say, the code was irreparably damaged. Instead, there is NO Chapter 10 to speak of. It's a shame, as I love a good, old chase sequence. Aside from playing through on different difficulties, there isn't much else to do once Garage has been initially completed, a process which took me around five hours on the easiest difficulty. One can opt to explore chapters for hidden notes containing passwords to various hatches located in the game, but this is merely for background story purposes. Nothing here that will motivate most players aside from the ones heavily engaged with the game. Unfortunately, for all of these aforementioned reasons, it's a bit of a challenge to recommend Garage. The game feels under-cooked, the loading times are too long, the visibility mechanic leaves something to be desired, the difficulty is sometimes unfair, the aiming doesn't have the most precision, and there's little to do after the game has been beaten the first go-round. There are some positives to garage, however, such as some cool boss battles, nice gameplay segments that break up the shooting (such as a fun motorcycle section, or calm, soothing raft ride), and adequate pacing. 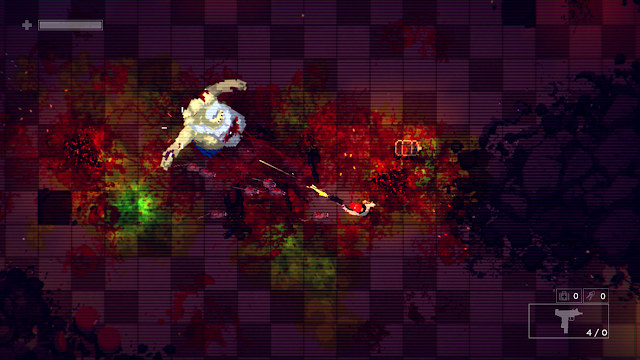 That said, Garage is a game that is better left avoided, unless you really need a top-down shooter on the Switch. We have arrived at SuperPhillip Central's first review of May, and it's for a 2D platformer that just can't stop getting ported. Who am I to complain, though, when it's a game that's as excellent as Rayman Legends? It's the Nintendo Switch's turn at the game, with what Ubisoft is calling the definitive version. It's Rayman Legends: Definitive Edition for the Switch. Let's check it out. The legend continues on Nintendo Switch. 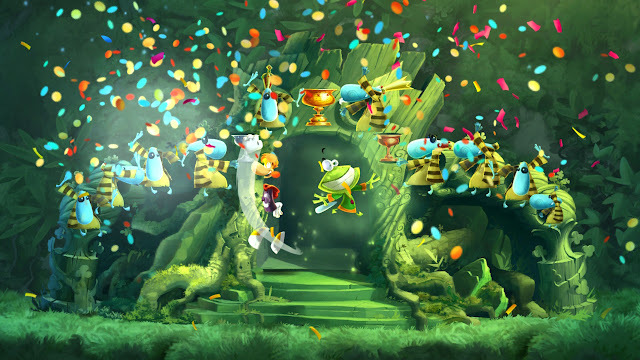 Rayman Legends was one of the standout titles on the Wii U, PlayStation 3, and Xbox 360. It has since been ported to nearly every platform under the sun, including PC, PlayStation 4, Xbox One, and PlayStation Vita. Now, the game gets yet another shot in the spotlight with a console it should be most welcome on, the Nintendo Switch--home to lovers of the platforming genre (thanks to a certain mustachioed plumber among many other Nintendo creations). The Switch version of Rayman Legends labels itself as the "Definitive Edition". Is this the case, or is the port a definitive dud? Let's skip all pretense here and allow me to answer that question immediately. 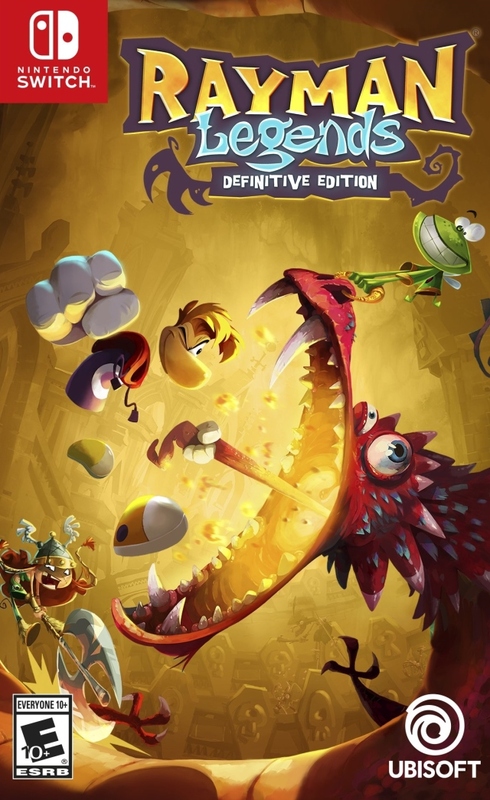 Rayman Legends: Definitive Edition is the total package here with all of the content of past ports and a new Kung Foot tournament mode included (though the latter isn't that big of a deal). 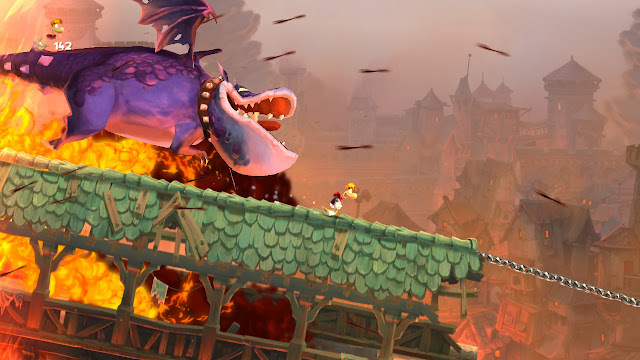 At the game's launch, Rayman Legends: Definitive Edition suffered greatly from poor performance and long loading times. This has since been patched to run as smooth as the lanes of a well-maintained bowling alley. Rayman Legends looked gorgeous when it originally launched in 2012, and it still amazes thanks to the awesome work put in by the Ubi Art engine and the artists who utilized it. A delightful orchestral soundtrack backs up the action, and there are certain in-level triggers that happen where songs will seamlessly conclude or change to their next section after specific parts of levels are entered or completed. It's a wholly fantastic, bombastic score, worthy of listening to outside of the game. If anyone has earned the right to strike a pose, it's Rayman. 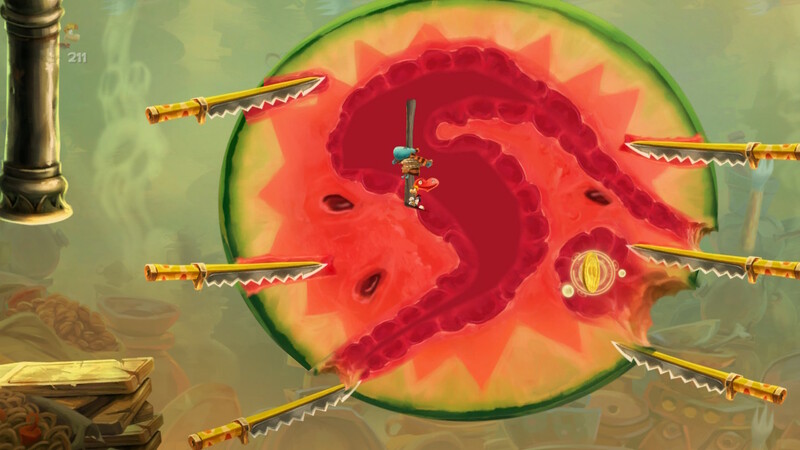 Rayman Legends itself is the same game as it ever was, a sequel to Rayman Origins. The game contains five worlds based on various themes, and each possess a plethora of levels in them that range from incredibly creative to devilishly difficult. They're all aces, regardless. What's fun about Rayman Legends is how the game constantly introduces new mechanics into its levels. Unlike a Mario game, these mechanics aren't one-off experiences. Instead, they linger throughout a world, constantly reiterating on themselves, and creating new scenarios and challenges in the process. 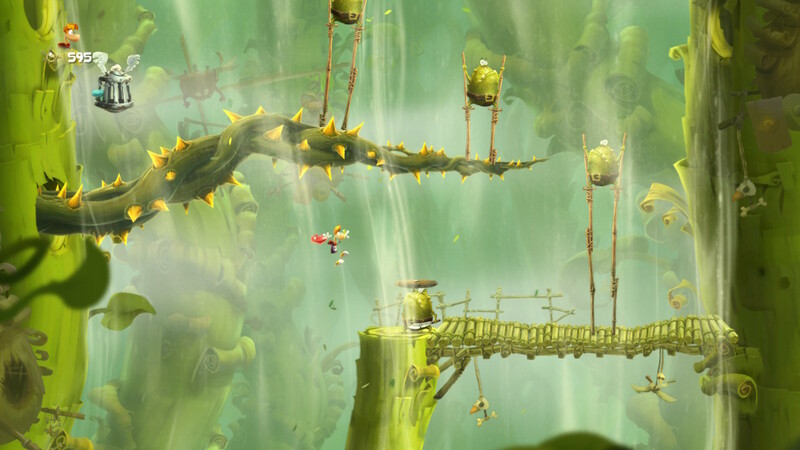 The second world of the game, Toad Story, introduces wind tunnels that Rayman can use to gain as well as maintain altitude or slowly fall to the ground. This mechanic returns in the rest of the levels in the world but in different ways. 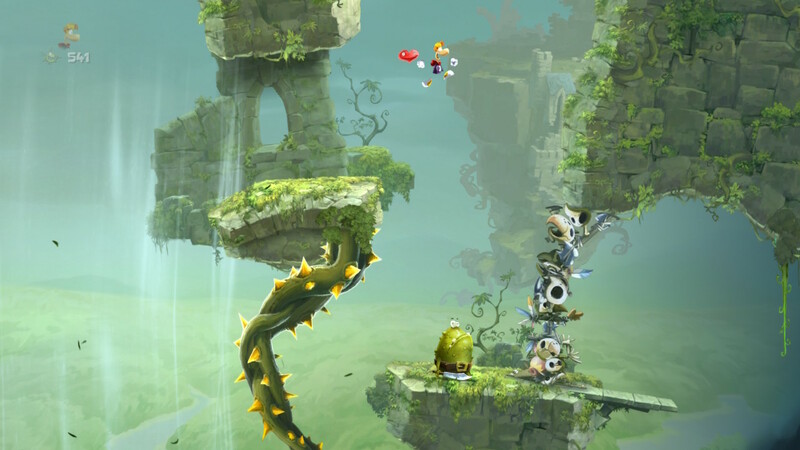 There are wind channels to guide Rayman through a corridor of thorny vines, wind channels to keep Rayman elevated over a continuous bottomless pit for one level, and wind channels to navigate a crumbling castle. Whereas Mario games take a mechanic and exhaust every idea out of it in one level, Rayman Legends goes the distance, takes off, and runs with them. ear infection! Wait a minute. Does Rayman even have ears? The levels keep pumping out new ideas or new twists on existing ideas that Rayman Legends remains refreshing to play from beginning to end. One level has you infiltrating an underwater base to press two buttons on opposite sides of the base to unlock a door to the final area of the level. The way to each button is simple enough, but when one is turned on, the power shuts off and the backup security systems engage. What could be a careless joyride through the level turns into a careful stealth section, dodging lasers and lights in spectacularly fun fashion. Stealthin' like Sam Fisher, boys. 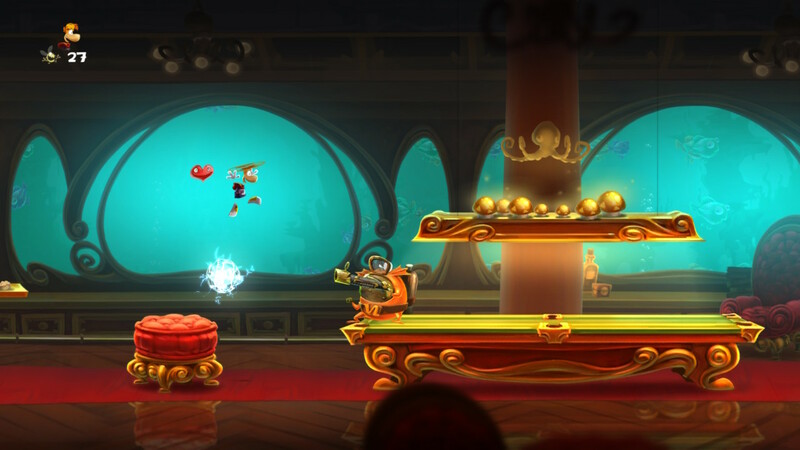 Meanwhile, another level shrinks Rayman down to a much smaller size. This allows him to walk along wires that he would otherwise grab hold of and slide down them in his regular size, as well as be able to enter small tunnels and channels that he otherwise wouldn't be able to go. 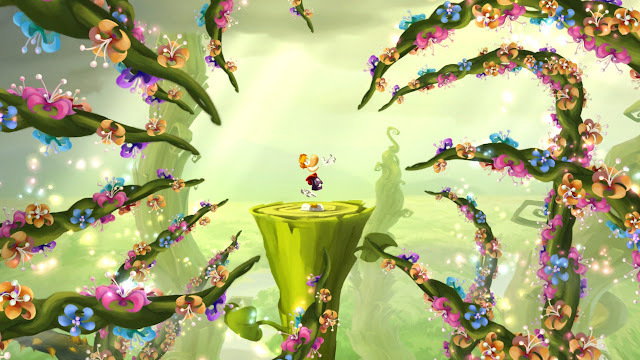 While he can't defeat enemies as tiny Rayman, he can use foes as platforms and a means to bounce up to higher areas. Sometimes Teensies are placed in some truly precarious locations. That melon smell is never going to get out of this one's robe. There are also some spectacular music levels that unlock at the end of each world that have you hopping, bopping, and smacking at a breakneck pace to the music. While many of these music stages contain hazards that are somewhat unexpected (and will kill you), making for the requirement to try them multiple times before you finally reach their conclusions, they remain enjoyable. The music levels require good timing to reach the end. Don't platform while off the beat! Even still, there is a bunch of refashioned levels from Rayman Origins in Legends--pretty much the majority from that game. These are a nice throwback to Rayman Legends's predecessor, and the new locations of hidden goodies make them worthwhile to replay if you've already burned through them in the original Origins. Like the PlayStation 4 and Xbox One versions, the Murfy levels of Rayman Legends: Definitive Edition have you controlling Rayman in the levels while pressing what I like to call the "Murfy Button" to have his winged friend interact with the environment--slicing ropes, moving platforms, tickling enemies, etc. While you're limited to this type of interaction in the campaign, you can play all of the Murfy campaign levels how Wii U owners did by using the touch screen to control Murfy while the rather smart AI controls Rayman or which ever character you choose to play as. Being able to both play as the character doing the actual platform and also being able to play as Murfy, interacting with the level, is something that I don't recall other versions of Rayman Legends having, making an argument that the Definitive Edition on the Nintendo Switch really is the definitive version of Rayman Legends. Rayman Legends: Definitive Edition is bursting from the seams with content, whether it's finding all of the captured Teensies, collecting enough Lums in each level, completing the ambushed levels (where you have a set amount of time to rescue three Teensies before they're rocketed off one-by-one), scratch tickets to collect that unlock new content within the game, daily and weekly online challenges, the Kung Foot mini-game (yay, I guess? ), and much more. If you somehow missed one of the hundred or so ports of the game, then Rayman Legends on the Nintendo Switch is a surefire purchase for platforming paradise. For everyone else, perhaps you'd like to own the Switch version of Rayman Legends, as the game definitely is definitive. Didn't I just say yesterday that there's enough negativity in our hobby, and now here's an article called "The 'Worst' Things About SuperPhillip Central's Favorite Games IV"? Hypocrite much? No worries, gang, as I'm delving into some personal favorite games of mine, doing my best to pick out what I feel is the strongest negative for each. With some games it's much harder than others! On this fourth installment of this nearly three-year-old series, games like Super Mario Odyssey, Ratchet & Clank, and Grand Theft Auto: San Andreas are featured. We begin with a duo of 3D platformers. The first is a game that got runner-up for Game of the Year at the SuperPhillip Central Best of 2017 Awards. (The Legend of Zelda: Breath of the Wild barely beat it.) I'm talking about Super Mario Odyssey, a delightfully masterful platforming adventure that spanned the entire world, as well as parts of space. The precision, fluidity, responsiveness, and tightness of the controls made for an exceptional game to play. Mario had a brand-new assortment of moves in addition to his repertoire of classics dating back all the way to Super Mario 64 in 1996. One could pull off some very impressive platforming feats with a combination of maneuvers both grounded and in midair. 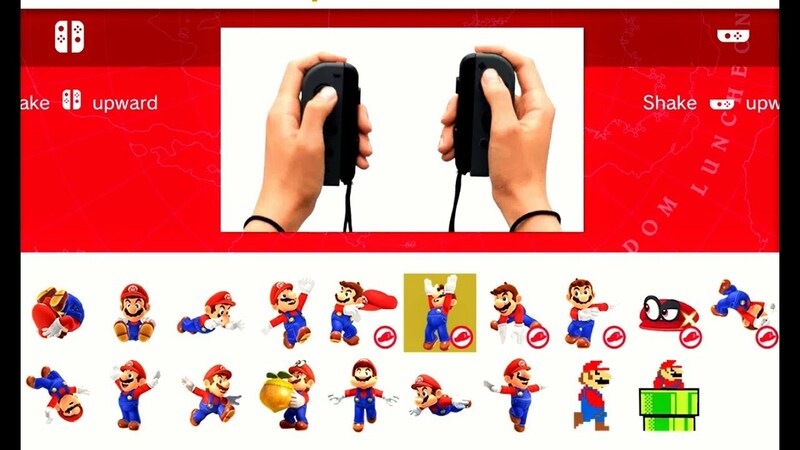 Many challenges in Super Mario Odyssey could be completed normally with these analog controls. 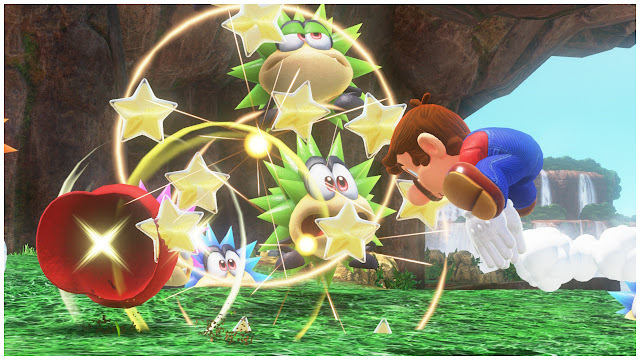 However, the optional motion controls, used for getting extra height on jumps, for instance, weren't so optional for some players, if they wanted to get every Power Moon in the game. Certain racing challenges for Power Moons would be close to impossible for certain players if they didn't shake the JoyCon controllers to give a boost to Mario's roll, and specific Power Moons would be much more difficult to reach without the aid of JoyCon-shaking to scurry up poles at a quicker pace. 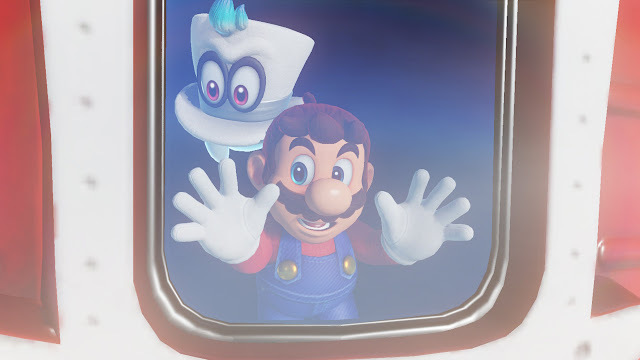 Now, no Power Moon in Super Mario Odyssey is designed with motion controls exclusively in mind, but without them, several Power Moons can be quite the pain in our favorite plumber's backside to attain. 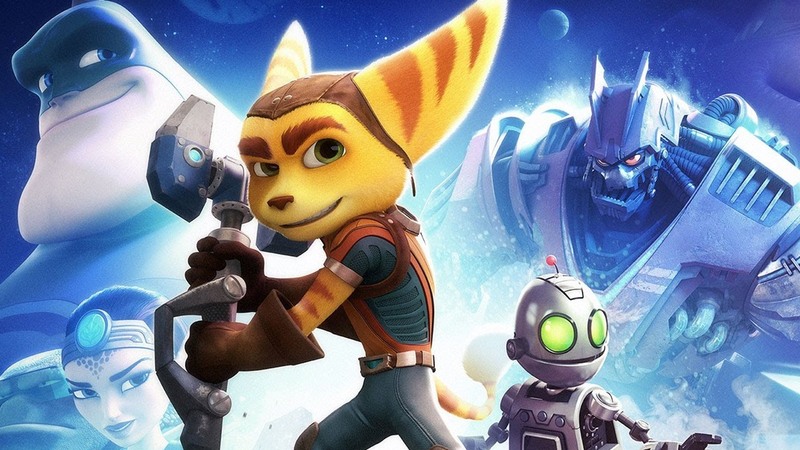 We move from a runner-up 3D platformer for SPC's Game of the Year of 2017 to the winner of SPC's Game of the Year for 2016: Ratchet & Clank for the PlayStation 4, the official game of the official movie, with the official lombax and the official robot buddy. 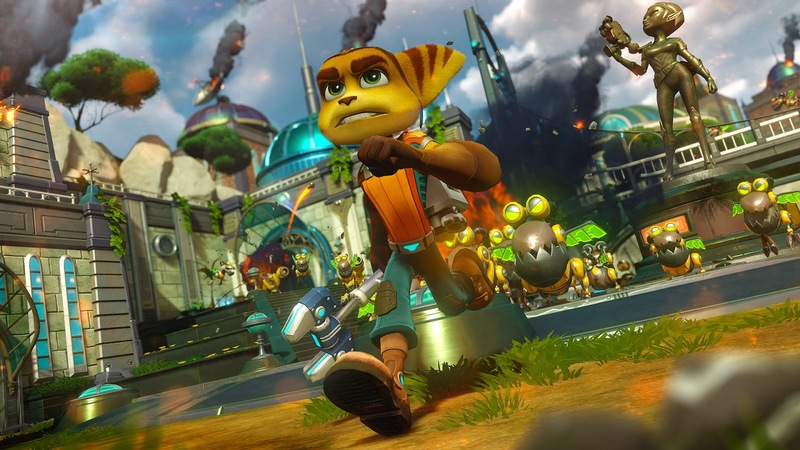 Ratchet & Clank's 2016 romp is a part-platformer, part action game that sees the heroic duo move from planet to planet, cleaning up the mess that Chairman Drek and his cronies have left behind in their wake. For the most part, the action remains steady and the pacing of the game keeps chugging along. That is until you get to some of the slower sections within this series reboot that ends up breaking the flow a little bit. I'm referring to the Trespasser puzzles within Ratchet & Clank. While these are a lot of fun to solve the first time around, the Ratchet & Clank games generally are meant to be played through multiple times in order to routinely save up bolts to acquire all weapons, as well as level up said weapons through continued use, and to unlock all of the trophies (if you're into that like I am, that is). Playing through the game the second, third, fourth, etc. time and constantly being met with Trespasser puzzles that you've already solved in a prior play-through and must solve them in the current play-through is a real chore. 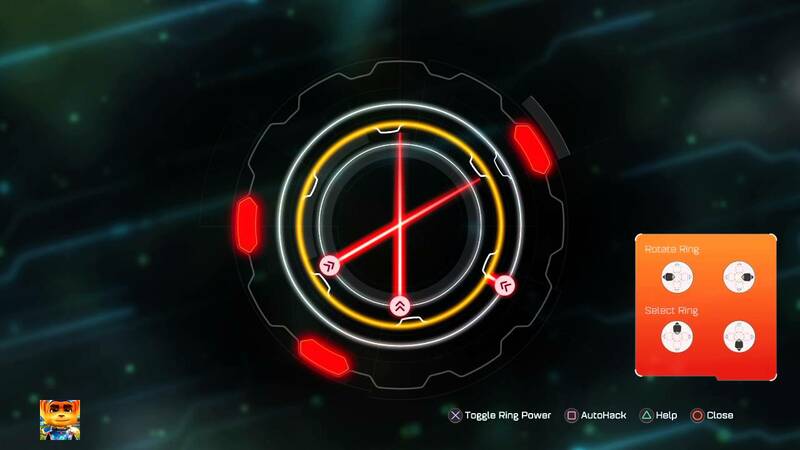 With Trespasser puzzles, you rotate multiple circles. The inner circle shoots out lasers. The goal is to have each laser hit a receptor in order to clear the puzzle and unlock the door you're not supposed to enter (at least by the standards of the person who originally locked it). Later puzzles introduce more lasers and receptors, as well as shields that block lasers from reaching receptors, so they have to be rotated correctly, too. Despite these slow periods in the game devoted to the Trespasser, Ratchet & Clank is still a top notch game, and the best release I played in 2016. %#$^ that side mission Supply Lines on the PlayStation 2 version of Grand Theft Auto: San Andreas!! There. It felt good to let that out. Did it get your attention as well? Then, I killed two birds with one stone! Supply Lines is a side mission in San Andreas where David Lynch will constantly tell you that his voiced character's humiliation is complete after you fail the mission. Over and over. And over. And over. Again. The goal of Supply Lines is to take out a handful of vans driving around different routes in San Fierro while you pilot a remote controlled plane with a gun attached to it. 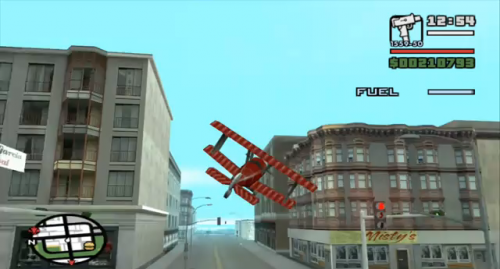 The RC plane has limited fuel, and it's so limited in the PlayStation 2 version that you have to pretty much perform a perfect run just to take out all of the vans--timing their locations correctly--and land at the ending point to clear the mission. 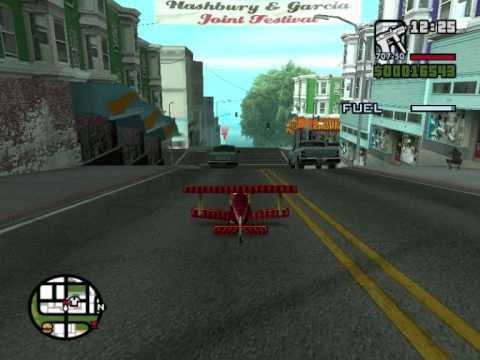 Supply Lines was so badly balanced and challenging in the original PlayStation 2 version of Grand Theft Auto: San Andreas that Rockstar made the mission significantly easier in all future versions, beginning with the Xbox port. My completed run of the O.G. Supply Lines is worn like a badge of honor... Or tremendous patience. One or the other. Unlike Grand Theft Auto post-III, I never really got into Guerrilla Games's Killzone franchise. 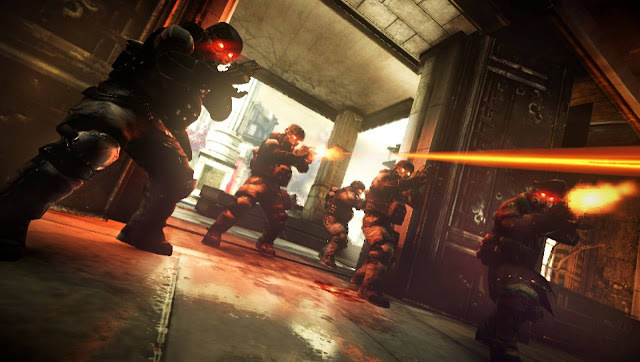 I know Killzone 2 was a showstopper with its amazing (for the time) visuals and presentation at one of the various E3s in the past, but it just didn't appeal to me. It was a poster boy for that generation at that time where brown and grey were popular colors to use, and Killzone 2 was the epitome of that. However, when I got my PlayStation Vita, I was yearning for a game that would incorporate those dual analogs on the system into a competent first-person shooter. Call of Duty Black Ops: Declassified failed to be a critical darling (it was the complete opposite, in fact), so I steered clear of that one. Then, Killzone: Mercenary launched, and despite its acclaim from the media and gamers, I was still skeptical. That was until I got my hands on the game, played through it, and loved every hour of it. The issue here is that there weren't a lot of hours to be had in the main campaign. Instead, the game's nine chapters were over quite quickly. For those who don't care about replay value--replaying and completing missions with three checklists of tasks, making for at least three runs per level total--then there wasn't much to be found in the single player campaign. I've read a lot of criticism about this aspect of the game, and it's understandable criticism for those who don't care to replay the same missions only with different rules and objectives to them. 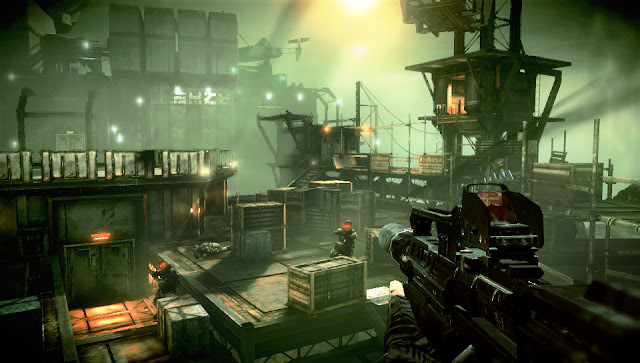 Still, Killzone: Mercenary is a stellar shooter nonetheless. 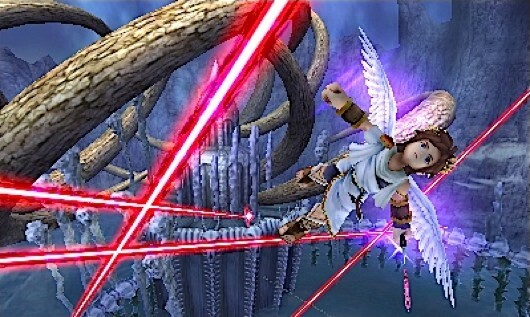 Pit's return in Super Smash Bros. Brawl for Wii after many decades on hiatus from his own series, Kid Icarus, was a shock to say the least. The popularity of the character and Smash director Masahiro Sakurai's desire to make a game in the Kid Icarus universe led to the franchise being reborn with the Nintendo 3DS hit Kid Icarus: Uprising. This game had it all: blistering fast action, great visuals for the Nintendo 3DS hardware, a stupendous soundtrack (one of my favorites of all time), both on-rails aerial action and ground-based combat/exploration, and yes, a control scheme that could really cramp up one's hands rather easily! Kid Icarus: Uprising really needed a system with two analog sticks or at least better ergonomics, as holding the Nintendo 3DS with one hand while using the stylus to aim and shoot with the other was quite a bother for many players. When a game needs to ship with a plastic stand in order to ease the strain and burden put on the player's hands, it's probably a bad thing. Just thinking out loud, though. I, personally, found comfort by resting the system on my leg or in my lap while playing, but even still, I, among countless others, would adore seeing Kid Icarus: Uprising put on a platform that's much easier to hold without having to live with inconvenience and occasional suffering to enjoy it. SuperPhillip Central loves to celebrate the best in gaming. There's enough negativity out there in the industry and hobby already, so why add to it? The best in gaming this time? The best boss battles of all time! This series of articles started on July 29, 2011, and it's only gotten stronger since then, accumulating bosses from modern games as well as those of the retro variety. 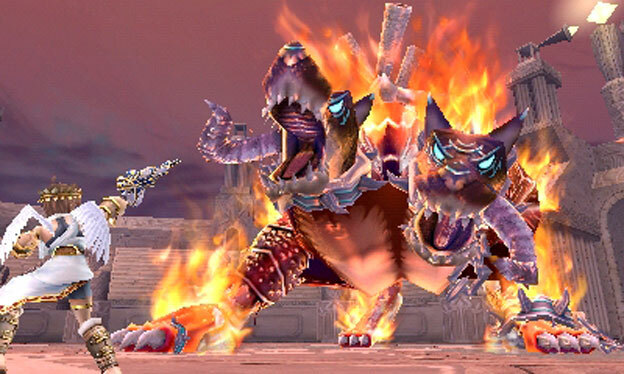 The long-recurring segment is back with five more epic boss battles that either: pose a sizable challenge, are rewarding to play, are pure fun to play, or are a combination of all three. Before we get to the next five boss entries, take a look at past installments of Best Boss Battles in Gaming History! Since there are spoilers for recent games, check out this article after the break! 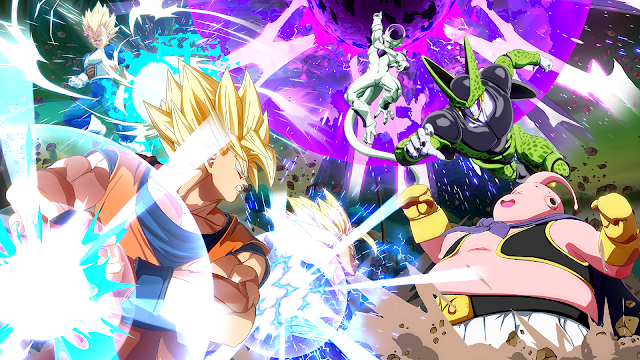 in SPC's featured game of the month, Dragon Ball FighterZ. It was a month of duos and pairs in April. We had clusters, dragons, and a single franchise being represented twice on SuperPhillip Central this past month! It all started with two games reviewed on the Nintendo Switch, Clustertruck (B-) and ClusterPuck 99 (C), games that both were a play on a different kind of word that features "cluster" in it. Then, we once again teamed up with Goku and friends, but this time it's one of the better licensed fighters around in Dragon Ball FighterZ, earning a B+, the highest grade of the month. That fighter was teamed up with another "Dragon" game based on art by Akira Toriyama, Dragon Quest Builders. It crafted and built a B score. Finally, the Hot Shots/Everybody's franchise doubled down at the end of April with Everybody's Golf and Hot Shots Tennis. While one game shot under par and the other game won match point, both ended up earning a fantastic B. If you build it, SuperPhillip Central will come and play it. 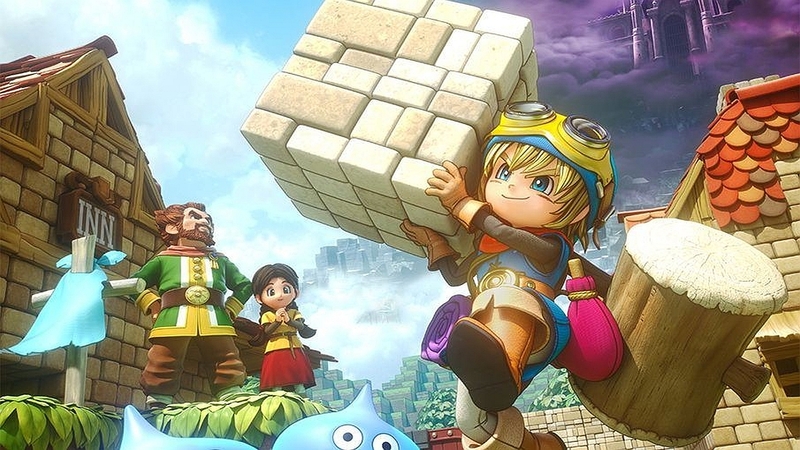 SPC did and ended up enjoying Dragon Quest Builders quite a bit this past month.